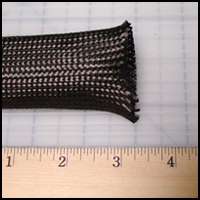 Carbon Fiber Braided Sleeves - CST The Composites Store, Inc. 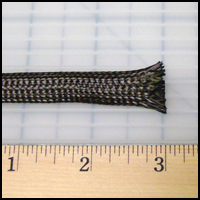 Carbon fiber tow braided to form sleeve or tube. Braided sleeve is very difficult to measure due to the extreme flexibility of the product. Therefore we weigh product based upon estimated yield. Technical information is provided by the manufacturer and is believed to be accurate although not guaranteed and is subject to change without notice. 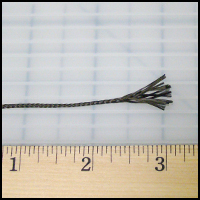 Carbon tow braided to form sleeve. All data assumes 45 degree fiber orientation. However they can be reshaped +/-30%. 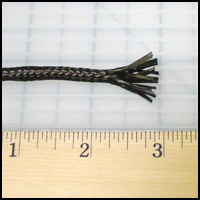 Carbon Fiber Braided Sleeve, 0.1" Dia., 1-9 ft. 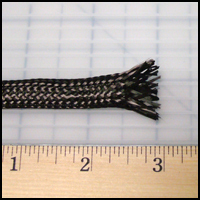 Carbon Fiber Braided Sleeve, 0.1" Dia., 10-24 ft. 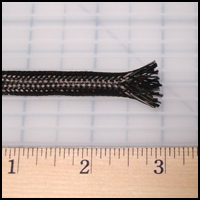 Carbon Fiber Braided Sleeve, 0.1" Dia., 25+ ft. Carbon Fiber Braided Sleeve, 0.2" Dia., 1-9 ft. Carbon Fiber Braided Sleeve, 0.2" Dia., 10-24 ft. Carbon Fiber Braided Sleeve, 0.2" Dia., 25+ ft. Carbon Fiber Braided Sleeve, 0.3" Dia., 1-9 ft. Carbon Fiber Braided Sleeve, 0.3" Dia., 10-24 ft. Carbon Fiber Braided Sleeve, 0.3" Dia., 25+ ft. Carbon Fiber Braided Sleeve, 0.4" Dia., 1-9 ft. Carbon Fiber Braided Sleeve, 0.4" Dia., 10-24 ft. Carbon Fiber Braided Sleeve, 0.6" Dia., 1-9 ft. Carbon Fiber Braided Sleeve, 0.6" Dia., 10-24 ft. Carbon Fiber Braided Sleeve, 0.8" Dia., 1-9 ft. Carbon Fiber Braided Sleeve, 0.8" Dia., 25+ ft. Carbon Fiber Braided Sleeve, 1.0" Dia., 10-24 ft. Carbon Fiber Braided Sleeve, 1.0" Dia., 25+ ft. Carbon Fiber Braided Sleeve, 1.2" Dia., 1-9 ft. Carbon Fiber Braided Sleeve, 1.2" Dia., 10-24 ft. Carbon Fiber Braided Sleeve, 1.2" Dia., 25+ ft. Carbon Fiber Braided Sleeve, 0.25" Dia., 1-9 ft. Carbon Fiber Braided Sleeve, 0.25" Dia., 10-24 ft. 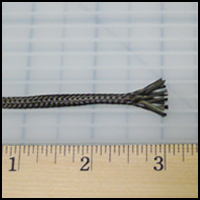 Carbon Fiber Braided Sleeve, 0.25" Dia., 25+ ft. 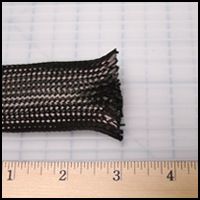 Carbon Fiber Braided Sleeve, 0.25" Dia., 1+ lbs. Carbon Fiber Braided Sleeve, 0.5" Dia., 1-9 ft. Carbon Fiber Braided Sleeve, 0.5" Dia., 10-24 ft. Carbon Fiber Braided Sleeve, 0.5" Dia., 25+ ft. 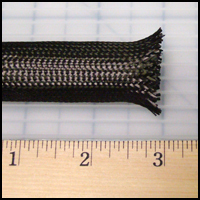 Carbon Fiber Braided Sleeve, 0.5" Dia., 1+ lbs. Carbon Fiber Braided Sleeve, 0.75" Dia., 1-9 ft. Carbon Fiber Braided Sleeve, 0.75" Dia., 10-24 ft. Carbon Fiber Braided Sleeve, 0.75" Dia., 25+ ft. 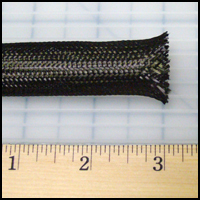 Carbon Fiber Braided Sleeve, 0.75" Dia., 2+ lbs. Carbon Fiber Braided Sleeve, 1" Dia., 1-9 ft. 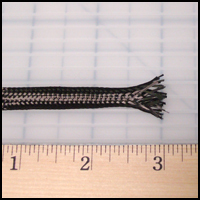 Carbon Fiber Braided Sleeve, 1" Dia., 10-24 ft. Carbon Fiber Braided Sleeve, 1" Dia., 25+ ft. 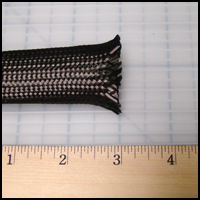 Carbon Fiber Braided Sleeve, 1" Dia., 2+ lbs. Carbon Fiber Braided Sleeve, 1.25" Dia., 1-9 ft. Carbon Fiber Braided Sleeve, 1.25" Dia., 10-24 ft. Carbon Fiber Braided Sleeve, 1.25" Dia., 25+ ft. 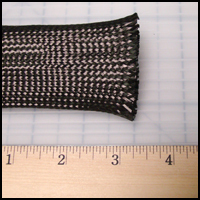 Carbon Fiber Braided Sleeve, 1.25" Dia., 2+ lbs. Carbon Fiber Braided Sleeve, 1.5" Dia., 1-9 ft. Carbon Fiber Braided Sleeve, 1.5" Dia., 10-24 ft. Carbon Fiber Braided Sleeve, 1.5" Dia., 25+ ft. 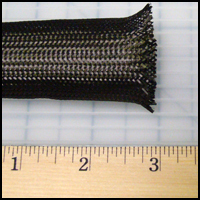 Carbon Fiber Braided Sleeve, 1.5" Dia., 3+ lbs. Price per pound, Minimum quantity 3 lbs. Carbon Fiber Braided Sleeve, 2" Dia., 1-9 ft. Carbon Fiber Braided Sleeve, 2" Dia., 10-24 ft. Carbon Fiber Braided Sleeve, 2" Dia., 25+ ft. 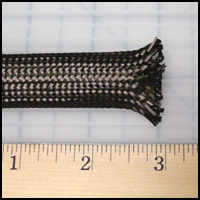 Carbon Fiber Braided Sleeve, 2" Dia., 3+ lbs.